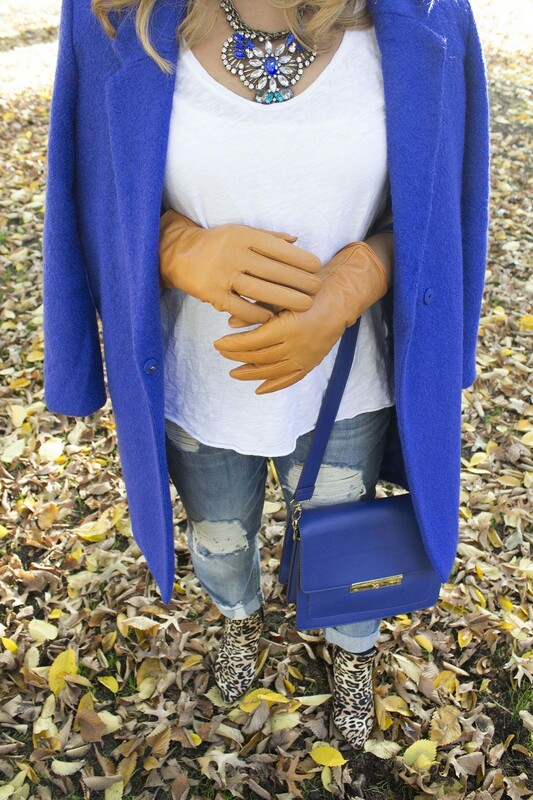 The best part about Fall and Winter are the fun coats we can wear. As the temperatures drop down, all I want to do is bundle up with fun coats and big scarfs. A statement coat is perfect to stay stylish through the cold months. A statement coat can be worn as the main piece, or as an accent. With this look, I let the coat speak for itself. I paired it with ripped boy friend jeans and my all time favorite, the white t-shirt. To bring out the blue, I wore a blue crystal necklace and structured blue bag. The contrasting color of the wolves and cheetah shoes also make the coat pop out. See another look here wearing the statement coat. Bright colored blazers are a must for anyone who loves color! Even if you don’t, they look amazing paired with all black. I absolutely love the color pink! So when I saw this hot pink wool blazer at Goodwill for under $10, my heart literally stopped for a moment. Click here for tips on thrift shopping. 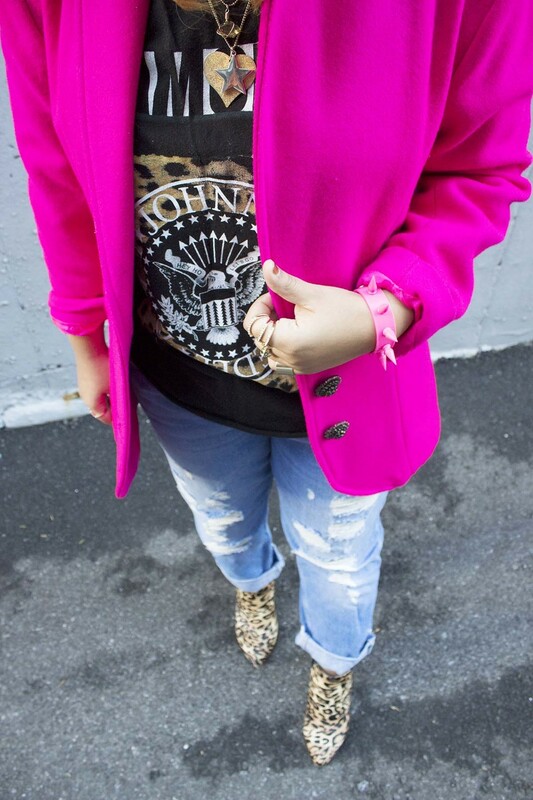 I paired this statement blazer with a logo tee and boy friend jeans to make it a super fun colorful look. I brought the cheetah print back by wearing these little booties. See another way I wore this blazer here. My biggest fashion advice: always take risks and try new things, after all there are 365 days in a year and you can be someone different everyday by wearing something different. Play with fashion and have fun! Leather makes a regular pencil skirt so much more interesting and ten times more fun to wear. They are great for work as well as a night out. Here, I’m wearing a fun work friendly look. A nice crew neck sweater is a perfect item to pair with a leather skirt. Key tips when buying leather or faux leather skirts are 1. Stick to a longer length if it's fitted. The skirt will look sophisticated instead of skanky. 2. Neutral dark colors look more expensive and they will automatically go with many other pieces in your closet. A blazer is also a nice addition to make the look more professional. I added fun accessories and colors through the statement neck, shoes, and clutch. Back wearing my favorite color combo, ever! I can never wear too much black and white. I’m channeling my inner Chanel in this look, but spiced up a little bit. I love this knit fit and flare skirt. Knitted skirts are great for the colder months because they keep you warm. Totally recommend giving them a try. I paired the skirt with a Chanel inspired black and white cropped jacket. I spiced it up withthese over the knee suede boots. See some of my other favorite black and white looks here, here, and here.